With the introduction of the ERB WPPSI-III Practice Test, Bright Kids NYC is excited to provide parents the opportunity to informally assess their young children. This exam is prefect to use for children preparing to take a preschool, kindergarten, or 1st grade admissions exam at an Independent School in New York City. Crafted to mirror the actual ERB admissions exam, your child will become familiar with the content and format of this challenging exam. Also included in this exam are detailed, word-for-word instructions, so that parents can easily and accurately administer this assessment. Bright Kids’ ERB-WPPSI-III Practice Test will allow parents to identify their child’s strengths, weaknesses, and overall test-taking ability. Bright Kids created this and a number of other test publications as children, no matter how intelligent they are, are often unaware as to how to perform well during these exams. Children can misunderstand directions, fail to consider all answer choices, and may not always read the questions carefully. Other children also struggle with having the attention levels to work steadily through these fairly lengthy exams. Along with these challenges, there are now so many different types of tests administered to children, that parents often become overwhelmed with the task of preparing their children for the day of the test. An ally in this struggle, Bright Kids has been taking the guesswork out of the process for years, providing the top material on the market for the OLSAT®, ERB, Stanford Binet, CogAT®, and NNAT® tests. Bright Kids’ ERB-WPPSI-III Practice Test will allow parents to identify their child’s strengths, weaknesses, and overall test-taking ability. Armed with this information, parents can then seek appropriate tutoring, materials, or activities to enhance their child’s test taking skills. Additionally, in order to emulate the actual ERB admissions exam, the Stimulus Book has been printed separately from the Instructions and Scoring Manual. As for the usage of this exam, the simple and colorful format of the ERB-WPPSI-III Practice Test will make this assessment easy and fun to use. Detailed instructions allow parents to quickly and accurately grade their child’s answers. Parents will walk away with a clear picture in their heads of what areas their children need to have developed and exactly where they are excelling. After issuing this practice test, parents can also choose to send their child’s scores in to Bright Kids to receive a detailed score analysis, and personalized test preparation advice. The Bright Kids model of tutoring is proven to deliver results and relies on individualized attention to each and every child’s skill level. The ERB-WPPSI-III Practice Test utilizes similar material to our in-house tutoring program that has delivered the success rate of 85% of our students scoring at the 90th percentile or higher on their ERB exams! 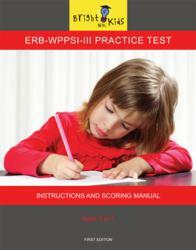 Reasonably priced, the ERB-WPPSI-III Practice Test comes with a set of handcrafted, eco-friendly blocks, full color pages, and an easy to follow guide to grading and proctoring for parents. To learn more, or to purchase the ERB-WPPSII-III Practice Test, visit http://www.BrightKidsNYC.com or call Bright Kids at 917-539-4575. About Bright Kids NYC: Bright Kids NYC Inc. was founded in New York City to educate parents about standardized tests through workshops and consultations and to prepare young children for such tests through assessments, tutoring, and publications. Our philosophy is that regardless of age, test taking is a skill that can be acquired and mastered through practice.